Katy Smith Perry is very passionate about winemaking AND Veranda Beach. "It's exciting to be involved in such a unique place where community, beach, golf, grape growing and wine come together. I am a huge fan of the Okanogon and am delighted with the quality of the wines that come from Veranda's estate vineyard. Of course none of this would be possible without the friendly and professional people behind everything that goes on here; it's been a pleasure for me from day one." Katy started her wine career at UC Davis in the late 80’s after a brief stint as Paleontologist lab assistant at the Smithsonian Museum of Natural History in Washington DC. While a student at UCD she worked on collaborative research projects between UCD and The Robert Mondavi Winery. After graduating from UCD she landed a job with the Benziger Winery starting a research viticulture and enology program as they went from organic to biodynamic. In 1995 a move to Geyser Peak Winery allowed a shift from research to production winemaking where she worked with “Aussie” Daryl Groom (formerly of Penfold’s) where she honed her Shiraz making skills. Daryl sent her to South Australia’s Yalumba Winery for a vintage to soak up everything ‘Shiraz’ in the world. Katy later jumped over to Napa to work at Stag’s Leap Wine Cellars. She worked as Assistant Winemaker to Warren Winiarski and Michael Silacci, where she made Napa Cabernet. Two years later an offer of head winemaker at a boutique Napa Carneros winery, MacRostie Winery, drew her away from Stag’s Leap for a chance to put her own stamp on cool region Pinot Noir and Chardonnay. Despite her success and world travels, Katy's home state of Washington beckoned her return. 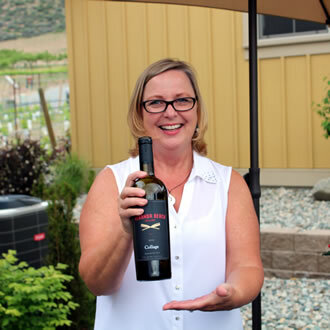 Katy was hired to speak in Lake Chelan in the late 90’s and fell in love with the area and the possibilities of a winery of her own where family and career would combine well. Her own winery would have to wait though, as out of the blue, industry giant Chateau Ste. Michelle called Katy about a winemaking position in Woodinville - another dream to come true first! Needless to say Katy was ecstatic to be moving to Woodinville and while at Chateau Ste. Michelle she worked alongside Eric Olsen and Ernest Loosen making the first vintages of “Eroica” and the ‘Single Berry Select’ Botrytized Late Harvest Riesling that won near perfect scores form the Wine Spectator. Katy and husband Milum did buy property in Manson though, in the Chelan area, and spent most weekends over the course of the following three years planting their own vineyard. Many days were also spent helping out the first “orchardists turned grape growers” in Chelan with tips and friendly advice. Katy and Milum opened Tildio Winery in 2005 and have steadfastly remained the ‘hands on’ winemakers and growers ever since. It's what they love! Producing wines for Veranda Beach Cellars is the current chapter in Katy Smith Perry's winemaking life story and, together with Veranda's Vineyard Manager Tony Angel, is pleased to bring you Veranda Beach Cellars Wines.